Believe it or not I kind of have a pen fetish. Every year or so I get a new pen. For that year I will use just that pen and, if I can help it, no others. I have had several Cross pens, a Sensa pen and a bunch of other no-name pens I thought were cool. 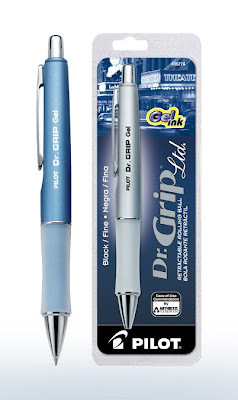 When it comes to a good pen I have a few things I’m looking for... it must have blue ball point ink, it must be a solid pen (no cheapo plastic) and it must fit in my fingers well. I have to have a solid feeling pen. I’m hard on pens. I flip them, drop them, sit on them and even throw them... Cross pens seem to hold up for about a year and then the clip will break or the twist will get too loose. Sense I’ve been in the bishopric I’ve had to fill out many temple recommends so I’ve need to use a very fine tipped pen to fill out the little fields on the rec. The hardest part of doing temple recommends is not going through the questions. The hardest part is writing legibly enough press through the 3 carbon copies. Actually, on second thought, the hardest part is not filling rec’s out it’s tearing out the two top copies out of the recommend book without ripping the other blank recommends. The bishopric has to account for all the rec’s in the book so you have to void any torn ones. I'm always on the look out for a good pen. If you have any favorites, let me know. it's true! He does have a pen fetish. It used to be expensive pens he would have to order all the time. shut up! I have been using that exact same pen for two years now. In fact, it ran out of ink mid-day through work today and I left work to go to the pharmacy for another. They are the best pens ever (although I wish they lasted a bit longer. but for $6 I can't complain). HELL! I'd just love it if we could KEEP pens in our house! They are always missing! Call me a real nerd, but I must have at least 3 colors. I used to have a cool one I got in Japan on a business trip (and used to buy refills for when I would go back), but I haven't been to Japan in about 2-3 years and it ran dry quite a while ago. I'm now using a blue barreled 4 color pen that is the exact same kind I had in Jr. High.